The migrants' faces in these images above are blurred by Migrant-Rights.org.The two photos above recently went viral in social media and messaging apps in Kuwait. 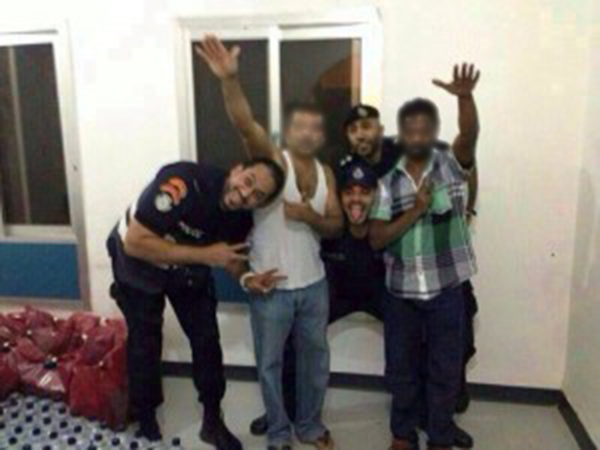 The photos depict Kuwaiti policemen posing with and humiliating arrested South Asian migrant workers, in excess of the normally reprehensible photos of detained migrants published in the media. The migrants are accused of selling alcohol, but rather than enjoying access to proper legal mechanisms, they were subject to spectacle: police shaved two mens' mustaches into the shape of Hitler's signature style and evidently forced them to pose with a Nazi salute. Migrants in the second photograph again appear fearful, coerced into another unnecessary mockery. Local Kuwaiti media largely failed to pick up the story, despite its wide circulation; only one column in the al-Jardia newspaper referenced the scandal, without mention of any significant details. 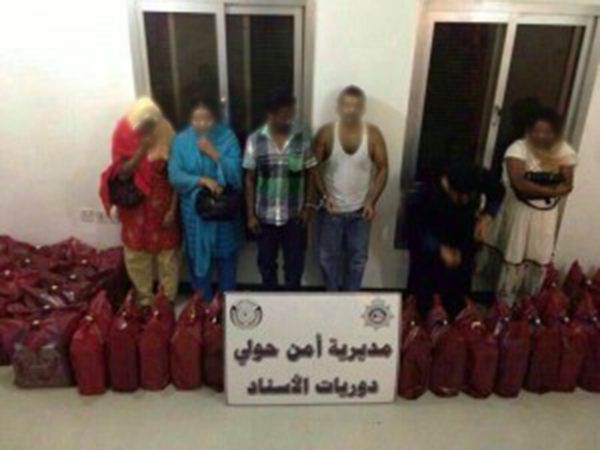 The Kuwaiti media's silence of these abuses is unsurprising, as portrayals of migrants are not often limited to their criminality rather than their victimization. Police have an obligation to protect citizens and migrants without discrimination, yet regularly become the perpetuators of abuse themselves. The right to redress and accessibility to legal avenues is codified in international instruments ratified by Kuwait, but migrants are resigned to fear authority, and cannot rely on them when reporting employer abuse or other crimes. With little hope in recourse for abuse, migrants may be forced to remain in situations of forced labor, or absconding from employers and entering the informal, more vulnerable employment -- a 'crime' in itself which may itself lead to arrest and further police abuse.